At first I thought that I would have nothing to add to the deluge of reactions to the fifth edition announcement. On reflection, I do have a few things to say. Consider this my signature on the Jeff Rients Type V petition (following the lead of Grognardling). Also, this one. I would be first in line to buy a high-quality collectable coffee table compilation book of old modules and adventures. I bet many people would, even those don’t actively play. Obviously, I would like to see legal PDF sales return (hopefully with higher production values this time around). Personally, I would be even more excited about a print on demand option, which might even be more acceptable to the company, as they might see it contributing less to piracy. However, if old content becomes available, I predict it will be something like a digital-only “D&D Archive” which will require a continuous D&D Insider (or whatever they choose to call it) subscription. That would pull in Grognard dollars without exactly competing with other offerings. Say a record company owned the rights to the back catalog of The Beatles, Elvis, and The Rolling Stones. Why would they be so stupid as to not market that back catalog? 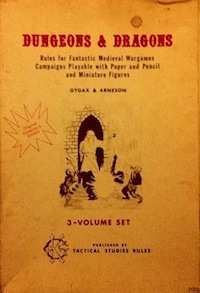 Rights to the old D&D products have the same status within the tabletop RPG community. And the content is already created; only minimal production work would need to be done. Would any record exec seriously argue that some teenager would be less likely to buy the new Gaga album because Johnny Cash material was available? What am I missing here? I haven’t been following the recent Wizards game design posts that closely, but I have read a few of them. It sounds to me like they want to seriously modularize the rules. That is a good thing, especially if they really emphasize that fiddly subsystems (e.g., skills, feats, psionics) are truly separate. I think there is a chance they might go this way with feats, but I seriously doubt they will remove skills from the core. Based on a realistic appraisal of the overall community of tabletop RPG players, I think the skills doubters (I belong to this group) are a tiny minority. If I were WotC, I would want the casual, Walmart market. This group, by lucky coincidence, might have the same requirements as those of us that prefer light rules. This entry was posted in Uncategorized on January 10, 2012 by Necropraxis.